Sarah Nader - snader@shawmedia.com Brynn Harasimowicz (left), 4, of Crystal Lake and her sister, Grace, 2, enjoy an ice cream at The Freeze in Crystal Lake after spending the day at the beach on Thursday, June 28, 2012. Mike Greene - mgreene@shawmedia.com Firefighters cool off using a East Dundee Fire Department truck while fighting a fire at Community Thrift Store Thursday, June 28, 2012 in East Dundee. Local and regional fire crews teamed up to take turns dealing with the fire in the scorching heat. Josh Peckler - Jpeckler@shawmedia.com Yosgard Salazar, 3 of Crystal Lake sprays his sister Lesly, 8 with water as they play in a small pool outside their home in Crystal Lake Thursday, June 28, 2012. With temperatures reaching near 100 degrees on Thursday, many people found their own ways to stay cool in the heat. 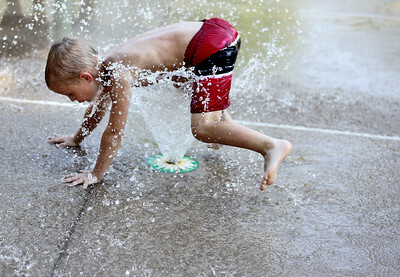 Sarah Nader - snader@shawmedia.com Braden Huff, 6, of McHenry cools off while playing at the Acorn Alley Splash Pad in Crystal Lake on Wednesday, June 27, 2012. Temperatures are expected to reach the high 90's this week in McHenry County. Mike Greene - mgreene@shawmedia.com Carpentersville firefighters Hector Gonzalez (left), Erik Vogel, and Monika Stawski cool off in chairs with ice bags while fighting a fire at Community Thrift Store Thursday, June 28, 2012 in East Dundee. Local and regional fire crews teamed up to take turns dealing with the fire in the scorching heat. Josh Peckler - Jpeckler@shawmedia.com Three-year-old Morgan Hill of Woodstock smiles as she swims inside the pool at Woodstock Water Works Thursday, June 28, 2012. Mike Greene - mgreene@shawmedia.com Brian Tepper, 14 of Cary, jumps off the high dive at the Cary Public Pool Thursday, June 28, 2012 in Cary. 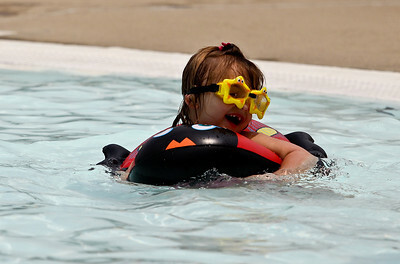 Tepper was one of many who fought the heat Thurday by visiting local pools to cool off. 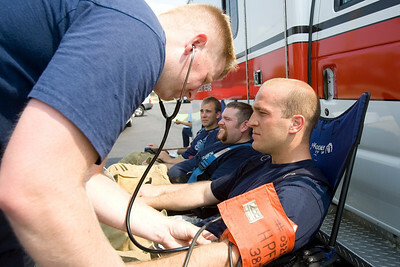 Mike Greene - mgreene@shawmedia.com Dan Nicholson, of the Hanover Park fire department, checks Carpentersville firefighter Matt Jackson's blood pressure while at a fire at Community Thrift Store Thursday, June 28, 2012 in East Dundee. Local and regional fire crews teamed up to take turns dealing with the fire in the scorching heat. 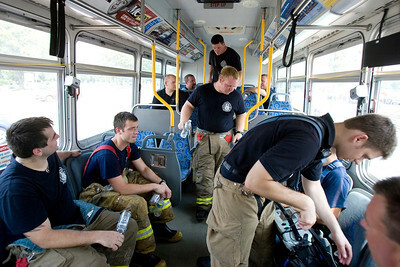 Mike Greene - mgreene@shawmedia.com Firefighters cool off in a Pace bus while fighting a fire at Community Thrift Store Thursday, June 28, 2012 in East Dundee. Local and regional fire crews teamed up to take turns dealing with the fire in the scorching heat. 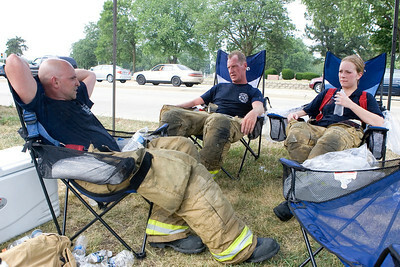 Carpentersville firefighters Hector Gonzalez (left), Erik Vogel, and Monika Stawski cool off in chairs with ice bags while fighting a fire at Community Thrift Store Thursday, June 28, 2012 in East Dundee. 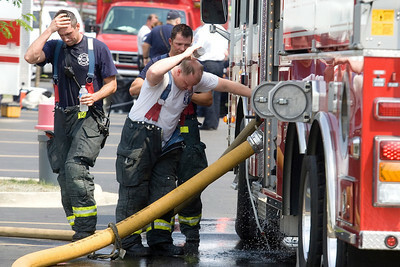 Local and regional fire crews teamed up to take turns dealing with the fire in the scorching heat.